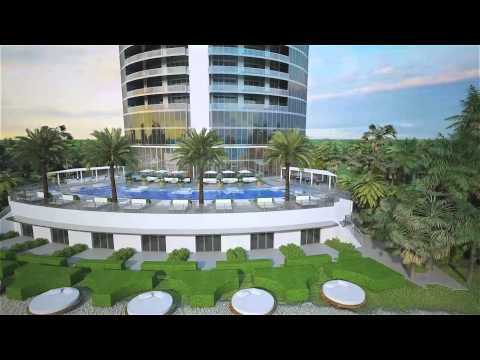 Porsche Design Tower condos in Sunny Isles Beach rises 60 floors and has just 132 residences. The units at Porsche Design Tower range from 4,252 to 16,915 square feet. Porsche Design Tower condominiums includes a patented elevator system called The Dezervator which allows residents to travel up the building directly to their condo all while sitting in their vehicle, taking all of 90 seconds or less. Porsche Design Tower Miami was developed by Dezer Development and completed in 2017. The condo development is situated directly on the beach offering views of the Atlantic Ocean and Intracoastal Waterway. Many of the residences at Porsche Design Tower include an oceanfront terrace with private pool and summer kitchen. The residents at Porsche Design Tower Miami enjoy posh amenities such as three pools, private cabanas, resort service at the pool or beach, a full-service spa, state of the art fitness center, fine-dining restaurant, and much more. Porsche Design Tower condominiums is located at 18555 Collins Avenue in Sunny Isles Beach, Florida. By car, Porsche Design Tower is 5 minutes from the Aventura Mall, 10 minutes from the Shops at Bal Harbour, 30 minutes from Las Olas, and 30 minutes from the Miami International Airport. How many floors does Porsche Design Tower have? Porsche Design Tower has 60 floors. How many units does Porsche Design Tower have? Porsche Design Tower has 132 condo residences. What year was Porsche Design Tower built? Porsche Design Tower was completed in 2017. What is the address of Porsche Design Tower? The address of Porsche Design Tower is 18555 Collins Avenue Sunny Isles Beach Florida 33160.